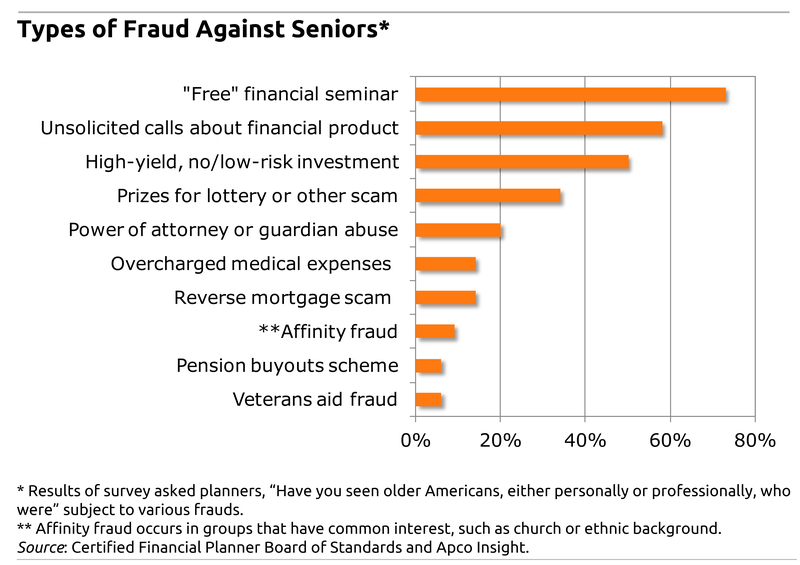 The seniors who are most confident of their knowledge about money and investments are also the most likely to fall victim to fraud. That conclusion, by Chicago researchers at DePaul University and the Rush University Medical Center, is among the first to explain the underlying reason for an alarming trend being detected by law enforcement and financial experts: a rise in fraud committed against an enormous and rapidly aging baby boom generation. The U.S. incidence of fraud has exploded in recent years. Complaints of financial fraud compiled by the Federal Trade Commission surged more than 60 percent in just three years, to 1.5 million last year. 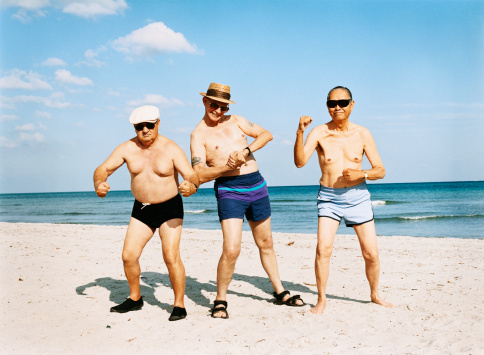 There is growing concern nationwide that boomers, due to what can be a dangerous combination of cognitive decline and having some money socked away for retirement, are extremely vulnerable to con men peddling financial products that make big promises and deliver nothing – or, worse, rob retirees of money they need to live comfortably or even survive. The Chicago researchers focused on seniors who have not acquired actual dementia or Alzheimer’s disease. Rather, they examined whether fraud could be linked to the cognitive decline that is a natural part of aging. First, they inserted a fraud question into surveys that are conducted annually by the Rush Memory and Aging Project, which questions the elderly about the gamut of their health, neurological, physical and mental developments. “In the past year, were you a victim of financial fraud or have you been told you were a victim of financial fraud?” they asked the Rush Project’s participants. The researchers then made the link between those who said “yes” and whether they were overconfident of their knowledge about money and investing. Overconfidence in the past has been associated with making poor financial decisions. For example, high-income men tend to be victimized by fraud due to their confidence in their investment knowledge. Overconfidence in this study was measured in a two-barreled financial literacy survey of 664 seniors. There were nine questions about their financial knowledge. Each of the nine questions was followed by this question: “How confident are you that you answered that question correctly?” The confidence scale attached to each question for each senior was between zero and three, with three being most confident – the highest (albeit unlikely) “confidence” score for all nine questions was 27. 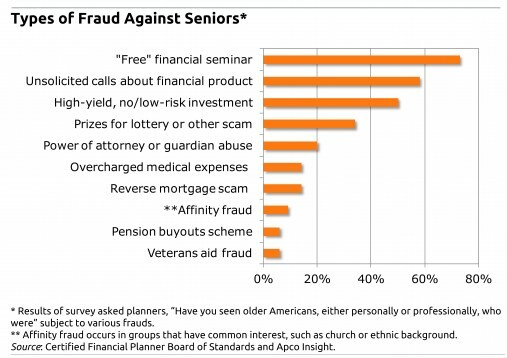 Seniors who got answers wrong but were most confident they got them right had also more often been victimized by fraud. Fraud victims scored, on average, 5.39 on the overconfidence scale, compared with 4.21 for non-fraud victims. The results were statistically significant and were further supported by a second measure of overconfidence: a tendency to make a “concentrated” – that is, undiversified – investment in a single company’s stock. “Having a concentrated investment [also] increases the odds of fraud victimization by a remarkable 174 percent,” the researchers concluded. Gamble said that he believes more research is needed to better understand why seniors fall for scams. But seniors might also be helped if they are made aware they’re vulnerable. “If individuals are more aware, then maybe they’ll be more cautious and avoid problems,” he said.